The above video has been trending on Facebook this past weekend and has already received over 1 million views on the social media server. 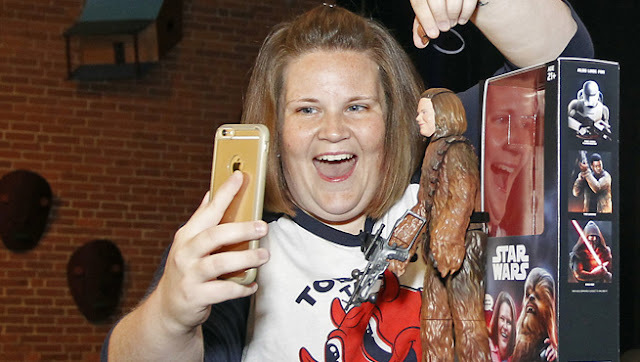 It has been exactly a month since Payne posted her famous 'Chewbacca Mask' video and since then, her fame has risen exponentially. She guested on James Corden's Late Late Show in America, alongside J.J. Abrams; spent a week, as an official guest, at Disney World and had an official showing around the Facebook HQ. I guess we should look at this as one of the 'great' social media stories. A mother of two posted a video of her putting on a Chewbacca Mask, which went viral. She has now become a cultural icon and is receiving gifts, as though she was royalty. I never want to sound envious about these things because it is such an amazing story, but it does make you wonder how far this will go? In a way, Hasbro should be thanking Mrs. Payne because there is no doubt in my mind, she has helped them generate sizable profits through the incremental sales of the 'Chewbacca Mask'. However, as with many things in our current media world, all fairy tales will eventually come to an end. The story of today is not necessarily the interest of tomorrow. I would say that Mrs. Payne should enjoy her time in the public spotlight, because I predict that public interest will soon fade, as fame is transient and non-sustaining. It may not be tomorrow or next month or in six months, but I wonder if this story will have as much traction in a year's time. She put on a mask, in a car and laughed a lot. I don't get it. I enjoyed her happiness don't get me wrong, but what about it merited all this? I actually don't get the hype about this... There are people actually doing miracles at building Star Wars props and cosplays without being recognized, and just putting a mask on and filming it gets tons of fame! Stop being envious and putting her down. She shared something that made her laugh and millions of people laughed with her. It's got nothing to do with talent or effort - it's an emotional connection - which is what Star Wars is all about. The answer is 'sales'. She unknowingly helped Hasbro in selling this mask better then any advertising agency in the world could have. They made so much more money off the product then they ever thought imaginable. She rightly deserves her 15 min in the spotlight.